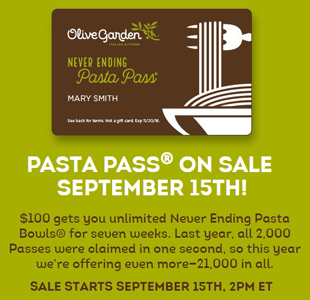 Olive Garden is offering a Never Ending Pasta Pass -Sale starts September 15th, 2PM ET $100 gets you unlimited Never Ending Pasta Bowls® for seven weeks. Last year, all 2,000 Passes were claimed in one second, so this year we’re offering even more—21,000 in all. What is the Never Ending Pasta Pass? The Pasta Pass® allows Passholder to enjoy the Never Ending Pasta Bowl promotion at Olive Garden as many times as they wish in-restaurant for 7 weeks. That’s right – unlimited food at Olive Garden for 7 weeks! Passholders and their guests also receive complimentary Coca-Cola® soft drinks. The Never Ending Pasta Bowl Promotion (and Pasta Pass redemption period) is October 3-November 20, 2016. The Pasta Pass is not available for redemption with ToGo orders, but in-restaurant redemptions are unlimited with your Pass. BOGO FREE Sour Punch AND Red Vines Coupons!